What beautiful autumn weather! Robins have recently been out and about in the local area exploring and enjoying this season. We have been learning about the signs of Autumn and what happens at this time of the year. We collected many objects of different colour and texture, we even saw wildlife too. The days may be shorter but we are certainly making the most of them! Hope you enjoy looking at the photos. What a fantastic way to bring our amazing topic towards an end, with a super day out at Snozone in Castleford. You can see from the photos and the videos what fun we had. This week in our science lessons, we will be investigating different materials, with a view to finding the most appropriate for making our own sledge. As always the behaviour of the children was second to none. The children in these two classes have worked extremely hard this term and have learnt so much about the Arctic and the Antarctic, we are sure there are some future scientists and explorers in our midst! Robins are currently learning about the coldest parts of our planet, the Arctic and the Antarctic. Therefore, last week’s weather was perfect for our topic. A few days ago, we had a visit from ‘a famous person from history’, Sir Ernest Shackleton! He came to share his story about his attempt to cross the continent of Antarctica in his ship ‘The Endurance’. Sir Ernest explained very well how the ship became trapped in the ice and how with excellent leadership and teamwork the whole crew managed to survive living on the ice for nearly two years! He set several challenges and tasks for us whilst he was here, all of which were competently completed by the children. The heavy snowfall after Shackleton’s visit was perfect for Robins, as it enabled us to re-enact more realistically the events of his famous expedition. We built ‘The Endurance’, pulled the sleds as Sir Ernest and his crew had done, made ‘Dogloos’ for the 69 dogs that were taken on the expedition and created Dogtown as Sir Ernest had ordered. We also used a very heavy rope and imagined that we were hauling one of the lifeboats across the ice, just as the 23 man crew had done. This didn’t quite go according to plan as we tipped Mrs Forbes out of the lifeboat! The ideas and imagination that came from the children were amazing! This historic event has certainly been brought to life in Robins. Robins and Chaffinches launched their new topic about Italy with a visit to a Pizza restaurant, where they were taught how to make authentic, individual pizzas by a real life pizzaiolo (pizza chef). Both classes had great fun choosing their toppings and learning about the ingredients used to make a pizza. After the pizzas came out of the oven, we eagerly tucked in and enjoyed the rewards of our efforts. Here are some of the comments from the children. Jenson said “This is the most delicious pizza that I have ever eaten”. Minnie sighed ”This is pizza heaven”. We also had fun making dough sticks, see how long we managed to stretch the dough! After having had a lovely lunch, we were ready to carry out our research on what makes a successful and fun mini golf course. We enjoyed playing and putting our golf knowledge and skills from P.E. into practice, whilst also evaluating several of the holes. This information will help us as we design our own Italian themed mini golf course. Haley said “It was a great day and it was a lot of fun” and Phoebe’s verdict was, ” It was the best trip ever, I have had so much fun”. Medieval Madness for Robins and Chaffinches! As a start to launch our learning about Castles, knights and Medieval times, we enjoyed a day of medieval madness. Throughout the day, children took part in a variety of activities to help them learn about some aspects of medieval life. Challenges included medieval games, constructing modroc castles, designing a jewelled goblet, a striking shield and a knight’s helmet. The children also listened to a medieval story that they then acted out. The children created two life-sized knights to guard our castle themed classrooms- come in for a look! Finally, a tasty treat of a jewelled biscuit crown was a great way to end a fantastic and busy day. 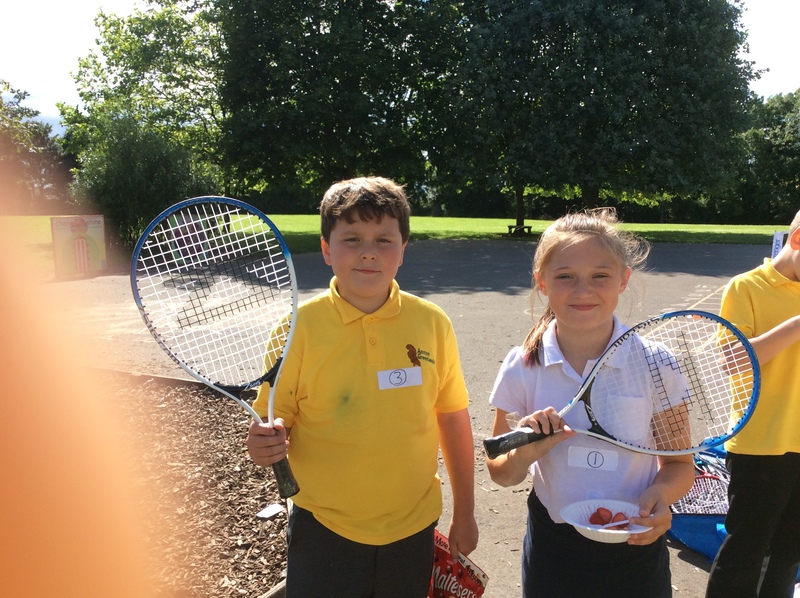 Tennis Club – it’s ace!!! We ended the tennis club with a Greenlands Wimbledon. We had a girls and boys competition, which resulted in crowning our 2 champions. We celebrated with the traditional strawberries and cream. Here are a few photos to show you what fun we had. As part of our big pedal challenge we held a big breakfast last Friday in school. The Bike It crew organised a small breakfast for those children and their families who travelled to school on their bikes and scooters. It was a great success and the atmosphere in the hall was brilliant. We calculated that 65 people joined us on that morning so on behalf of our schools Bike It crew, we thank you very much for your valued support. Here are some lovely photos from the event. 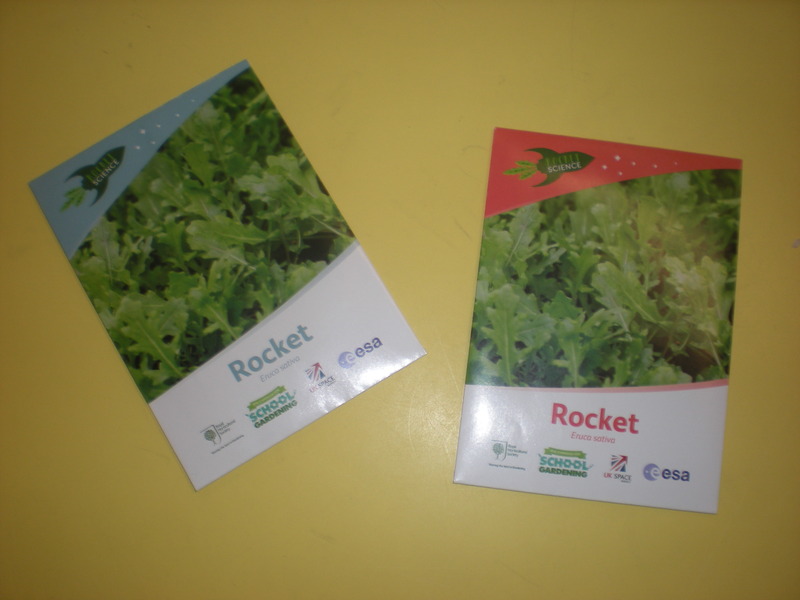 Robins are launching into Space with their new topic this term. On the first day we held a special WOW day. We made jet packs and control panels for our role play ‘Mission Control’, we baked star and moon biscuits, made a giant rocket for our classroom door and created a model of the solar system with papier mache planets. Outside, we have been drawing the solar system on the playground and guiding ‘Neil Armstrong’ to land the ‘Eagle’ on the moon, by using the correct positional language. Other exciting activities so far this term have included, eating astronaut food, dressing like an astronaut and working as a team to produce a giant sewing of the solar system. In our music lessons we have used the boomwhackers and the hand bells to perform Twinkle Twinkle Little Star to Mr Wirth – he guessed the tune straight away! Finally, we have also had lots of fun learning about forces. This helped us to understand how a rocket moves through the air. During the afternoon, we had a rocket balloon race, we made paper mice fly in the air and we finished the afternoon by launching a water rocket. Watch the video to see how high it went. 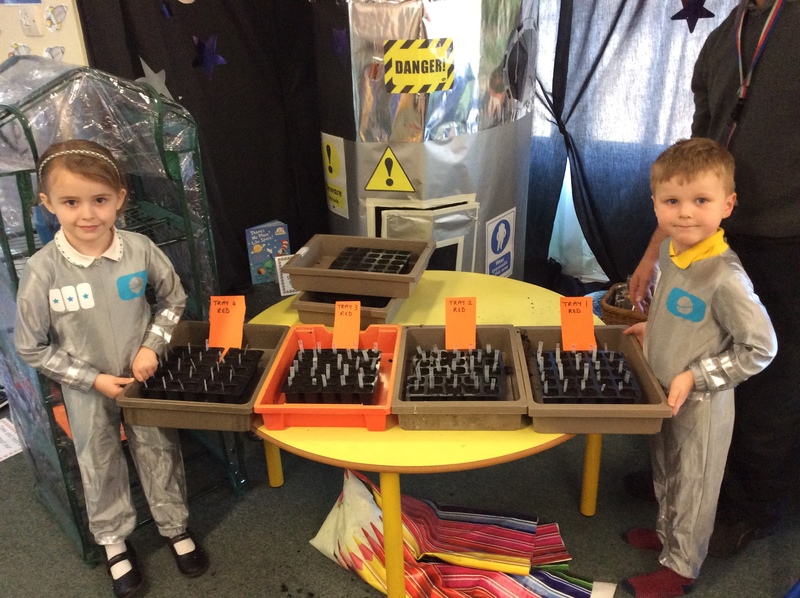 Robins have just found out that they have been chosen to take part in the European Space Agency’s Rocket Science experiment We have been busy planting 200 rocket seeds. In a few weeks it will be revealed whether the seeds in the red packet have been in space for 6 months or the seeds in the blue packet. Meanwhile, we have lots of data to collect to send to ESA and Major Tim Peake! Look out for our photos in Rotherham Advertiser. What a fantastic way to end a super half term of learning about Harvest and Autumn. Robins performed a selection of songs, dances and poems to parents and grandparents. The children started their Harvest Festival with a lovely rendition of the traditional hymn, ‘We Plough the Fields and Scatter’. Other highlights included an Autumn leaf dance to Vivaldi’s ‘Autumn’, a rousing version of ‘Mr Scarecrow’ with some fabulous scarecrows and fantastic dancing. They even performed the Haka dance at the end. After the performance the parents were served refreshments, which included homemade fruit crumbles and pumpkin biscuits. A very big thank you to all the children that performed; the speakers, the dancers, the singers – everyone had a part to play in making the Harvest Festival a successful event. We would also like to thank all the parents, both those that were able to come and support the children on the day but also for their support in practising lines, finding clothes etc. Robins are also very grateful for the donations of food which have now been sent to the Archer project in Sheffield, a charity which helps homeless people. Finally, the Scarecrow competition that Robins organised also proved to be a hit. We received 25 entries and we are sure that you will agree the scarecrows came in all sorts of shapes and sizes. A very big thank you to the families that took the time to take part, therefore ensuring that it was a great success. The winning scarecrows were: 1st place– Georgia from Snowy Owls, 2nd place- Reece from Robins and 3rd place- Jake from Robins. Well done! Robins have some new additions to their class – 5 scarecrows! As part of our learning about Harvest, Robins have been finding out about the important job of a scarecrow. The children were so enthralled with pictures of scarecrows, that they decided to design their own and today the scarecrows came to life. Thanks to a lot of team work and creativity, the 5 scarecrows took shape and now stand proudly around school. They will shortly take up their position in the school garden. Making the scarecrows has also inspired the children to plan a scarecrow competition for the whole school. Please keep an eye out for information coming home shortly.